In addition to our Production services, WEW offer Video DJs, Karaoke, Music hire, and sound system equipment. A premium mobile service available to setup nearly anywhere. Private functions, Venues, or at your home. Premium JBL P.A Equipment from 400w to 16,200 watts ! Projector screens from 6ft to 40 feet ! Video DJ is a cost effective option for venues with installed AV, Plasma, LCD and Projection equipment. 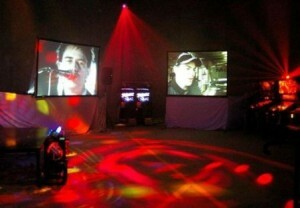 A great option in clubs / hotels with projectors in function rooms, and T.A.B video walls. WEW equipment is the most advanced of its kind, and is hired by many discerning corporate and club clients including most leading radio stations and event management companies. The Video DJ service always includes an operator, who delivers, sets up, packs up, and takes away. A ‘turn key’ service which means no worries for you. Do you want to DJ yourself with our mobile hire sound system equipment, or your own iPod or Laptop computer, using our speakers, wireless cordless radio microphone and disco lights. WEW supply everything you need to make it happen. And yes, WEW deliver and pack it up for you. If you have great people skills, Lots of microphone experience, a friendly outlook, honest, trustworthy and self motivated, then you may just be the person we are looking for. You must have far better skills than the average mobile operator.